A superb Capote essay with never-before-seen photographs originally commissioned to accompany it make an ideal match–and a great story. Truman Capote’s essay about Brooklyn Heights, N.Y., filled with clever observations in his familiar style, was first published by Holiday magazine in the 1950s. It was reprinted in 2001, with a foreword by George Plimpton, which is included here. 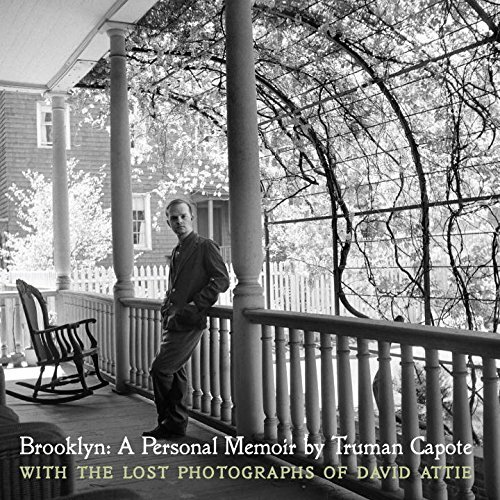 However, the singular contribution of Brooklyn: A Personal Memoir: With the Lost Photographs of David Attie is those photographs, discovered in 2014 by the late photographer’s son in dusty wooden boxes. The story Eli Attie tells in his afterword is as compelling as Capote’s witty and winning portrait of Brooklyn. Capote’s career was distinctly tied to Attie’s when the latter was hired to photo-illustrate Breakfast at Tiffany’s for its scheduled appearance in Harper’s Bazaar, which Eli learned only decades after his father’s death. Capote’s essay is of course brilliant in its scenes, characters and language. “Sunstruck scraps of reflected river-shine” and the lovely alliteration of “plenipotentiaries from the pearl-floored palace of Poseidon or mariners merely” exhibit his decorative, evocative way with words. The historic contribution of this glimpse at a place in time is significant; and the same must be said of Attie’s documentary photographs, which perfectly complement Capote’s text. Since Harper’s Bazaar ultimately cut the novella, the included images went unpublished, including several of a young Capote, framed against the “beautiful staircase floating upward in white, swan-simple curves to a skylight of sunny amber-gold glass” in the house where Capote lived (in the basement). This marriage of Capote’s glimmering words with Attie’s harmonizing photographs is perfected by the younger Attie’s narrative, in this unparalleled addition to the Capote canon. This review originally ran in the November 17, 2015 issue of Shelf Awareness for Readers. To subscribe, click here, and you’ll receive two issues per week of book reviews and other bookish fun!